Happy Weekend! Here are three great money tips that you should check out. Read this blog: I Will TeachYou To Be Rich. At first I was skeptical when I heard about the blog because the title sounds so ambitious, but when I read some of Ramit posts, I realized that the content of the blog is chock full of good personal finance tips. There’s also a book. It is less than three weeks to April 15. If you know you won’t be able to file your income taxes properly by the tax deadline, then file later. FileLater will file personal tax extensions for only $17.95 and file business online tax extensions for $39.95. Yesterday, I met Alex Ressi, the founder of Tweet What You Spend which is a great tool for tracking your daily spending. Instead of sending a public tweet, you use the direct message to “twys”. He showed me that you how his site takes your tweet and can export your tweets into a cash journal that can be an Excel or a .CSV file. This is good because you can later import the cash entries into any accounting applications that accepts those files. 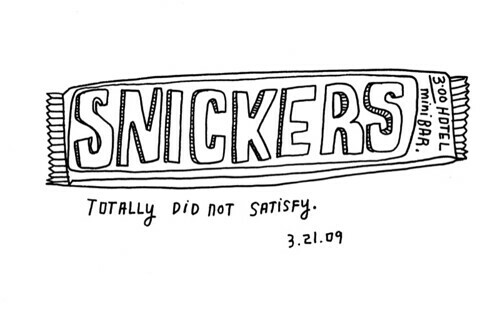 Tweet What You Spend reminded me of Kate Bingaman-Burt who draws what she spends like the illustration above. Outright enlisted the help of two bookkeepers Jeanné Neubelt of BookWorks Total Bookkeeping Services and Cheryl Hinkson of For Your Business Bookkeeping Services to compile a list of nine “hardest to classify” business deductions. When you first hang out your shingle, you might head down to the local printer to get some business cards made up. But what kind of expense is that? Which do I choose: Supplies, Legal & Professional Services or Advertising? As a self-employed individual, odds are your business cards will be given out to prospective customers in an effort to generate revenue. For this reason, the most appropriate category would be Advertising. You pay a monthly hosting fee to firms like Host My Site. Does that go under equipment rental? Office expense? Which do I choose: Advertising, Utilities, Equipment Rental or Office expense? Which do I choose: Cost of Goods Sold, Office Expense, Supplies, Legal & Professional Services? In this case, it depends on how the items are used. As Cheryl explains, “A web designer or graphic company that has signed up for unlimited access to stock photos available online would expense the monthly or quarterly fee to supplies for Cost of Goods Sold.” However, in the case where the images are being used for your business web site, “you could easily classify the expense as Advertising or Supplies”, says Jeanné. You’re now in business for yourself, so you get a super cool name to use. How do you treat the costs of doing that? Which do I choose: Taxes & Licenses or Legal & Professional Services? How do you treat the graphic designer who created the look and feel for your web site? Which do I choose: Legal & Professional Services or Contract Labor? You fork over the money to purchase the latest version of Adobe’s CS4. Which do I choose: Supplies? Office Expense? Depreciation/Section 179? Being the fan of web-based software that you are, you have monthly subscriptions to FreshBooks for your invoicing. But where do those expenses go? Which do I choose: Utilities, Office Expense, or Taxes & Licenses? Here we get different opinions. For Cheryl, “In a simple set of books I would classify payments to a Web Services Provider to utilities as you are utilizing their program.” However, Jeanné recommends placing them under Office Expense. There are still times when you have to send this by snail mail. And that does in fact cost money. Which do I choose: Supplies, Office Expense, Other Expense? According to Jeanné, you would place the costs under “Office Expense if it is a few rolls of stamps or the postage meter for letters.” However, for large shipping costs, place them under Other Expenses. You need your caffeine, we know. But what kind of deduction is that? Which do I choose: Supplies or Office Expense? Royal Bank America is on twitter with their Spur The Economy Program. Maybe not all banks are evil. I going to follow them to see what’s the deal. Looking for a job? Posting a job? On Twitter? Check out Tweet My Job. Less than one month to go before the April 15 tax deadline. Here are some tax tips. Don’t forget to make a contribution to an IRA. South by Southwest Interactive is way more tech than small business, but there was some good business information to be gleaned from my four days in Austin. Two great panels that were applicable to small business were the “Making Ideas Happen” talk by Scott Belsky of Behance, and the Bootstap Your Startup panel. Check out the slideshow presentation by Bijoy for the Bootstrap Panel. One of the best pieces of advice I heard about being productive is: “Don’t let your inbox overrule your to-do list”. The Finance 2.0 panel was great. I just wish more people came to the panel, because the panelists and I really want people to know that managing your money is important. Here’s some links to people who wrote about the panel. Check out the tweets at http://twitter.com/sxswfinance. On the SXSW tradeshow floor, I got a quick demo of Rudder.com. It looks like a good tool for cash flow management. Yesterday, Saul Colt from Freshbooks set up a lunch so I could meet the founders of Outright, Shoeboxed and Batch Blue. The cool thing about all four of these companies is that they are using each others’ APIs to collaborate. This results in an online eco-system of small business applications that goes from soup to nuts. The business cycle includes CRM (Batch Blue) invoicing (Freshbooks) , expense management (Shoeboxed) and basic bookkeeeping and Schedule C calculation (Outright). I am here in Austin for SXSW. Today, I will speaking on a panel at 10am. I am so happy to be on the panel with Mint.com‘s Aaron Patzer, SmartyPig.com‘s Michael Ferrari, Murali Subbarao of Billeo, and Stessa Cohen. Please come if you are in the town for “South By”. The panel will be in Room 18, Level in the Austin Convention Center. The hashtag for our panel is #finsxsw. WAKE UP! The New York Times has an article about how the Stimulus Bill helps small businesses. Namely, it may help some taxpayers avoid the alternative minimum tax. Looking for cheap and stylish business cards? This blog post may help. Fed-Ex is doing something special for job-seekers. On March 10, you can print 25 copies of your resume for FREE. Check out LaidOff Camp and Miss Pink Slip for resources if you are newly unemployed.